A recent survey conducted by the Methods & Tools software development magazine asked who was performing the functional testing in the IT department: specialized testers, software developers or end-users. Functional testing looks for differences between the initial end-users’ requirements and their actual implementation in the software application. The results indicate that specialized software testers are still predominantly in charge of this activity. Compared to a similar poll conducted at the beginning 2010, the results for each question are almost identical in 2013. The very small progression of the importance of software developer is not really meaningful in my point of view, even if it might indicate a trend that should be confirmed by future surveys. 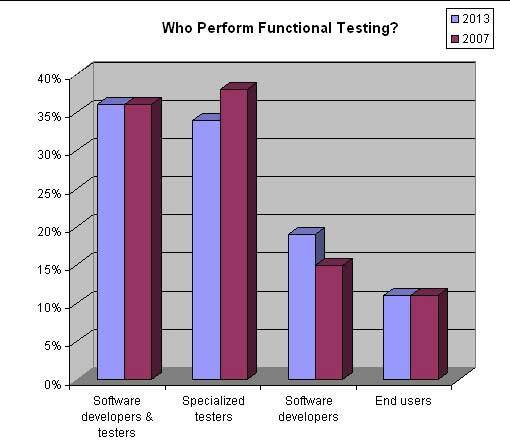 * Who Perform Functional Testing?